The 1,000 Facebook Follower Giveaway has been going smoothly so far, so back to swatching! 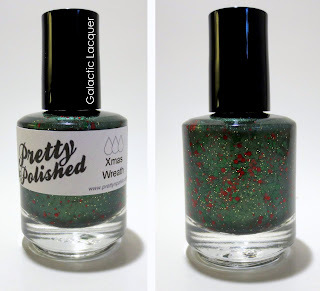 I have yet another exciting polish from Pretty & Polished. 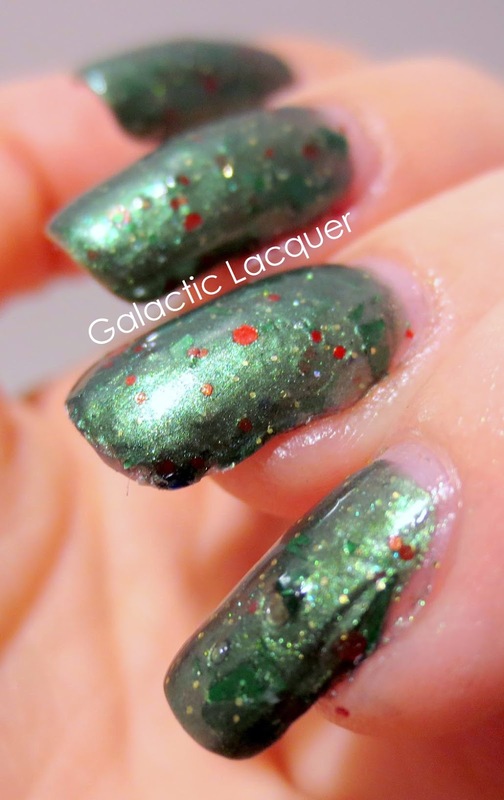 I absolutely love her polishes, and her holiday collection is stunning. Today I'm wearing Xmas Wreath. 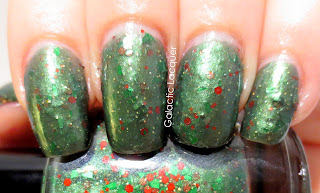 Xmas Wreath is a wonderful deep green polish. It's pigmented with a shimmery green, and has green metallic shreds in it. It also has a couple different sized red hexes, and tiny flecks of holographic micro glitter to make it glisten like a real frosty wreath. This polish is really pretty. I definitely does make me think of holiday wreaths when I see it. The green shreds are absolutely perfect since they're so irregular, just like real branches of a holiday tree or wreath. The red isn't too dark, and contrasts nicely with the green. It got a little lumpy on my pinkie nail, but that was partially my fault. The shreds all lay flat on their own, but I apparently didn't smooth that one out well enough! Still, where the glitter is completely random. I didn't manipulate any glitter, so there is definitely enough in there to get a good, even cover without worrying about it. The polish is just beautiful in general. 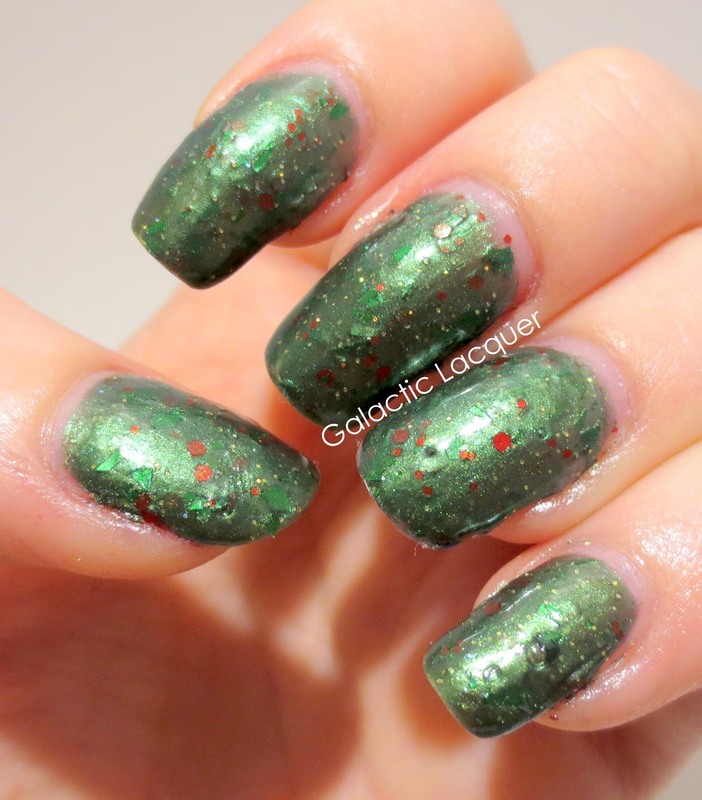 I really love deep green for the holidays, and this polish is perfect! I love how it has little bits of red to be festive, but it isn't too much green and red. It looks pretty classy and nice this way without being too festive and bright. 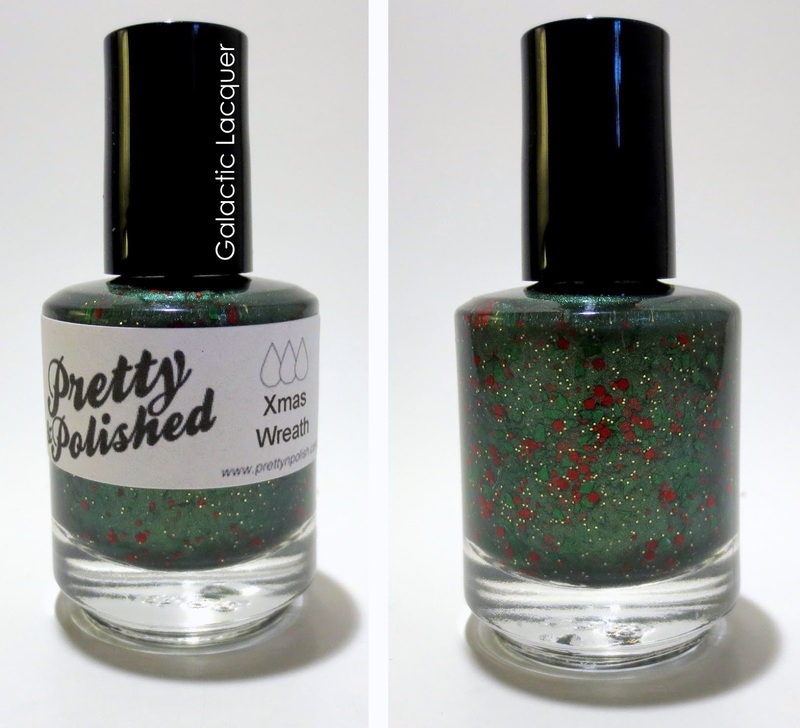 Pretty & Polished's holiday polishes are out now! You can purchase the full size of Xmas Wreath for $8.50, and the mini size for just $4.50. 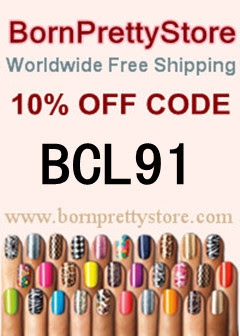 Or you can buy all seven holiday polishes in a full size set for $56, or the mini set for $31. I think I need more now, especially that penguin one!